Decisions, decisions. 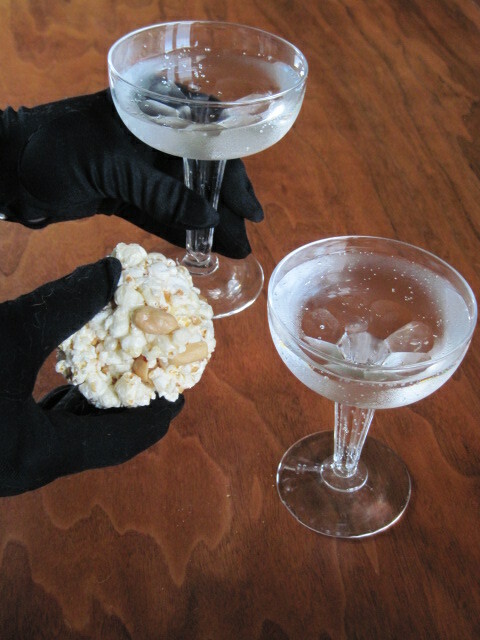 With so many great Halloween wines to choose from, how do you decide just what wine goes with Halloween Popcorn Balls? We decided to make Old Fashioned Popcorn Balls for any mischievous trick or treaters that might darken our doorway on October 31st. Hold on just one dang minute — We live on a farm kilometres away from where the masked hordes of marauding children dressed as Miley Cyrus, Alice in Wonderland, pirates, ballerinas, princesses, Spider Man or as Lady Gaga in her meat dress congregate. So, no chance of giving any of those delicious popcorn balls away. Hummmm…too bad. It is a good thing we did not anticipate any trick or treaters as we needed all our popcorn balls in the name of scientific research. We needed to discern which wine paired with Halloween Popcorn Balls. Our first sample was a 2009 Viognier Riesling Sauvignon Blanc but our taste testers found the orange overtones did not meld well with the vinegary notes. Our next taste test was a 2008 Pinot Noir. It had a classic Pinot Noir character with lots of plum jam and subtle cinnamon notes but, sadly, this did not marry well with the salted peanuts. Our third sample was a Traditional Spanish sparkler with long-lasting notes of honey, vanilla and damp earth. Its silky texture was lifted by good acidity. Definitely, a fine partner for popcorn balls. So, there you have it. 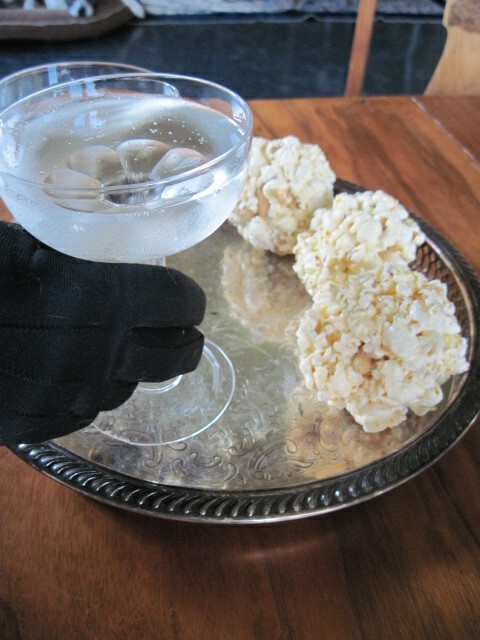 Champagne is the wine of choice when dining on popcorn balls. You might want to tuck this recipe away for next Halloween. Your choice of popping method! 1. Pop popcorn. Your choice of cooking method. 2. 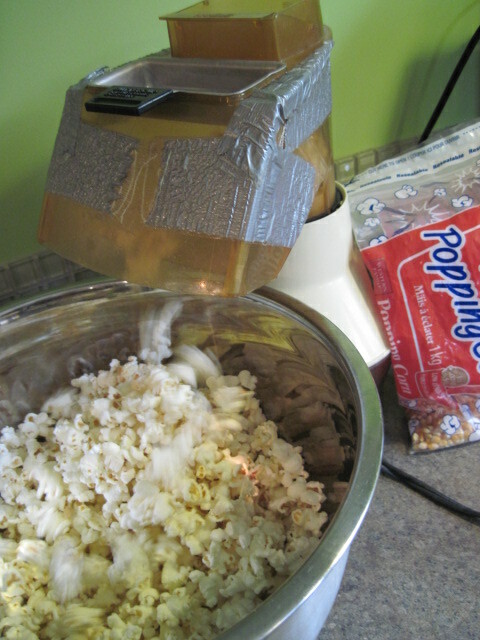 In a heavy 1 1/2 quart saucepan, combine the sugar, water, corn syrup, salt and vinegar. 3. Stir over heat until sugar is dissolved. Bring to a rolling boil and boil for about 3 minutes. Using a candy thermometer cook until it reads 250F (hard ball stage). If you don’t have a candy thermometer (and there is really no reason why you should) keep at a rolling boil for 5 minutes longer. 4. Remove from heat and stir in vanilla. 5. 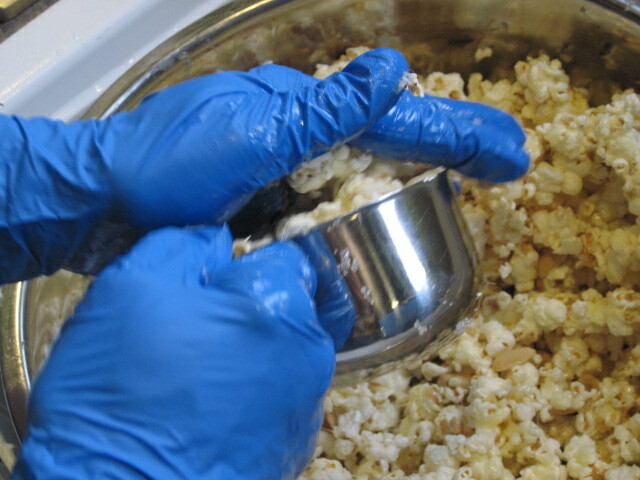 Pour boiling hot sugar mixture over popped corn to coat the popcorn. I prefer to use food grade rubber gloves liberally greased with butter. Be careful, it is very hot. Quickly form into balls. One cup makes a nice sized ball. Wrap in festive paper and give to friends or, conversely, eat them all yourself. 6. Pour yourself a glass of champagne and enjoy! I fully support your balls and think champagne would go really well while injesting them.